Let's start with a quick review. AMCA is the Air Movement and Control Association: an international, not-for-profit association of manufacturers who build air-system components, including fans, louvers, dampers, air-flow measurement devices, and other HVAC components. 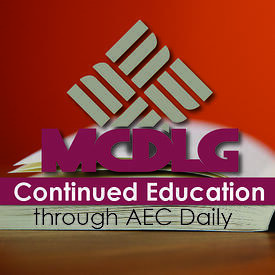 AMCA establishes reliable standards and test protocols for HVAC equipment. 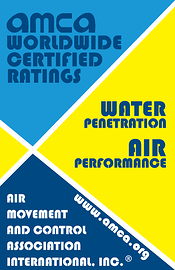 When an air-flow product has been tested under these protocols, it receives an AMCA Rating Seal. Industry professionals look for AMCA seals when selecting air-control products, because they know the data provided by the manufacturer was gathered from a reliable source. Let's take a look at some of those seals. These apply to louvers. The AMCA seal for Air Performance refers to a louver's ability to allow air to pass through its free area with minimal resistance. Tests measure the louver's pressure drop - the change in air pressure as ventilation passes through the louver - at various air velocities. Testers record these data points on a graph. This graph can be used to determine the amount of pressure drop for the louver at a given air velocity. An AMCA Seal of Air Performance means that the data collected for that louver was gathered from an approved test performed in an AMCA approved facility, using a series of standardized methods developed by AMCA. Make sure to review the pressure drop data provided on the louver's submittal. The AMCA seal for Water Penetration refers to a louver's ability to block light rainfall. The primary data point for this seal is the beginning point of water penetration. For the test, a louver is installed into simulated duct work and subjected to rainfall. Intake air passes through the rain and through the louver, increasing in velocity as the test progresses. The test is complete when a certain amount of water has passed into the the duct work, or if the air velocity has reached a maximum velocity threshold of 1250 feet per minute (FPM) without accumulating the maximum amount of water allowed. The beginning point of water penetration is the moment, in air velocity, that the maximum amount of water has accumulated in the duct work. If the air velocity reached 1250 FPM first, then the beginning point is recorded as "greater than 1250 FPM". Like Air Performance, the seal for Water Penetration means that the data presented was collected from a standardized test, developed by AMCA and approved by ANSI. When you see the seal, check the louver's water penetration data to determine its capabilities. 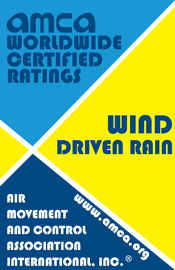 The AMCA seal for Wind Driven Rain refers to a louver's ability to block rainfall carried by high winds. Unlike the Water Penetration test, the Wind Driven Rain test involves several data points: air velocity and air ventilation through the louver's free area, an effectiveness ratio and an effectiveness rating class. Like the Water Penetration test, the louver is installed into simulated ductwork and subjected to rainfall. For the Wind Driven Rain test, the rainfall is pushed by an assembly that simulates wind. The test consists of two stages. Stage one subjects the louver to heavy rain conditions: 3 inches of rainfall per hour at wind velocities of 29 miles per hour. Stage two simulates a severe storm: 8 inches of rainfall per hour at a wind velocity of 50 MPH. Data is collected and recorded at several moments throughout each stage as the air velocity increases. Also, at each recorded point, the louver is given an effectiveness rating that dictates how well the louver blocks the rainfall. 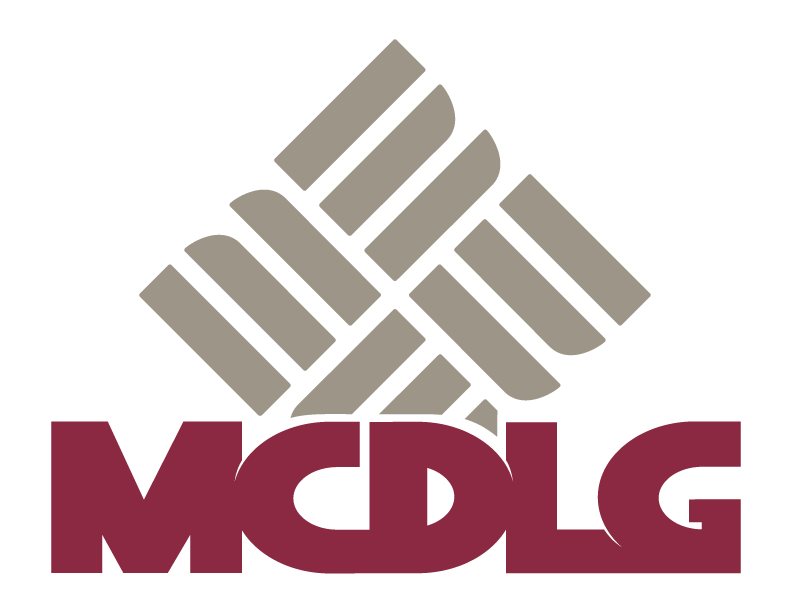 The effectiveness rating is given as a percentage and a letter rating from A to D, known as the Effectiveness Rating Class. When you see the Wind Driven Rain seal on a louver's submittal, look to the louver's Effectiveness Rating Class. This will help you determine how the louver performs in heavy rain. For adjustable-blade louvers, an Air Leakage seal refers to the louver's ability to keep air from passing through blades in the closed position. The test for Air Leakage measures that amount of air volume that passes through closed louver blades at various static pressures. Results are recorded on a curving line graph. Like all AMCA seals, the Air Leakage seal only means that the results were gathered via AMCA-approved test standards and methods. Be sure to check the Air Leakage graph on the louver's submittal to determines its effectiveness. When an AMCA seal is displayed on a submittal, it is followed by a statement from AMCA. The statement is a required part of the seal in submittal documents. It must be displayed beside the seal in documentation, because it clarifies the seal's purpose. [Licensee’s name] certifies that the [product designation] shown hereon [or herein] is licensed to bear the AMCA seal. The ratings shown are based on tests and procedures performed in accordance with AMCA Publication 511 and comply with the requirements of the AMCA Certified Ratings Program. The AMCA Certified Ratings Seal applies to [AMCA Ratings] only. The AMCA statement beside each seal alleviates any confusion about what the seal means and what it pertains to. This way, everyone knows that an Air Performance seal for a manufacturer's louver is only for Air Performance and does not pertain to other louvers, no matter how similar they are in design. AMCA seals are there to provide peace of mind. You can trust a product's performance when it bears an AMCA seal. The data for that louver comes from a trusted source adhering to reliable standards.